I haven't finished my spritebase yet. 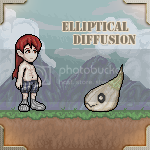 Tiles and bg art by SeraphSoul. Background reminds me of Drakkhen II, on the SNES. And Lagoon. Also on the SNES. Ohsrry, will work on that! Confirmed skin tones for ED.